Ibrox Noise: DAY 1 - Steven Gerrard at Rangers - can you feel it? DAY 1 - Steven Gerrard at Rangers - can you feel it? Today Steven Gerrard formally begins work as the new Rangers manager. And yet, despite it being confirmed weeks ago, and the 38-year old being paraded in front of thousands of fans at Ibrox, it still doesn’t feel real that one of the biggest British football legends of the past 30 years (up there with Beckham, Giggs and Bale) is now Rangers boss. There’s a real tingle about this one, a real sense of excitement that frankly feels alien to Ibrox Noise with respects to Rangers in recent years. Sure, we’ve brought in some big names – Joey Barton, Niko Kranjcar to name just two – but no one we have signed since Paul Gascoigne in 1995 comes as close to Gazza for sheer global stardom as Steven Gerrard does. There is no coincidence that the fanfare over Frank Lampard’s identikit move to Derby County (good luck Frank) has achieved minimal media interest by comparison – we wish him the best there, he’s a good man and was a wonderful player, but Steven Gerrard to Rangers is one of the biggest British football events in a long, long time and goes beyond box office. We sense a buzz about this that we just cannot recall recently in Scottish football at all. Rangers down the years were always the box office team – the ones who made the Galactico signings, the ones who brought in Gazza, Boli, Alves, De Boer – with varying success, sure, but the headlines, and the impact on the reputation of the Scottish game brought in global exposure you just can’t buy. And Gerrard is as big as any of these – his first job in management,and a world class midfielder, who most England fans would probably consider the best player they’ve had in 20 years, goes to the Famous Glasgow Rangers who have been down on their luck but whose global reach is almost as big as Gerrard’s. It’s box office meets box office and there is little doubt Gerrard will command absolute respect in the dressing room while we await to see just how good a manager he will turn out to be. 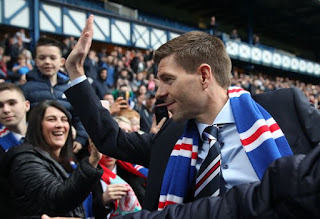 The number of fans tuning in worldwide now to see Gerrard in Govan has given Rangers a stunning new number of followers – Gerrard has millions of fans worldwide, and putting him in the hotseat has created interest in Rangers we previously didn’t have – ergo, revenue. We must never underestimate the size of Rangers. We are a sleeping giant. But Gerrard is a superstar, there’s no other word for it. And he can wake us up, which will send his reputation into the stratosphere while restoring where Rangers should be and perhaps creating even more in this new era of Scottish football. Even now it still doesn’t seem real. Like a Wee Boy at Christmas! He will drag us up by our bootlaces! And now the real work starts, there now will be no place to hide he has got to hit the ground running and fast,we have lost so much time with the managers before SG came here i wish him all the best and a huge welcome to Scottish football. Good luck Big Man! Take us back to where we belong. WATP!! Aye, get in tae them... let's go. Must take exception to your reference to Joey Barton as a big name player. He was no more than mediocre in the EPL and so it proved to be. Good luck Stevie G. Please be the right man for us. We need to start getting things right NOW!!! Bit early to break the champagne out folks! Steve Gerrard is a Liverpool legend as a player. Let see at the end of the season if he become a Rangers legend as a manager! We have had false dawns before, and whilst I agree that he has a big name, that's all it is this far! I can only hope and pray he has the same success as Souness did. I wish him and the new management my best and will be there to support them. Recruitment is key, both out goings and incomers. Time will tell, but my feet are firmly on the ground until I see results on the park!